There is general agreement throughout the industrial world that large complex projects have had a very rough go. In fact, megaprojects fail more than twice as often as their under $1 billion counterparts using the same criteria for failure. However, it is easy to overlook the fact that about one complex project in three is highly successful. The successes are too numerous to dismiss as flukes. It has been previously shown that when large complex projects followed a particular set of practices, they were quite likely to generate not just good, but genuinely excellent outcomes. This indicated that success and failure were not in any sense random. What we could not satisfactorily explain is why relatively so few megaprojects actually employed sound practices. The failure to do so could not be explained by ignorance because the practices are known throughout the modern projects world, especially over the past 15 years. The missing piece of the puzzle is to be found in the nature of project leadership, how leaders are selected for complex projects, and how they must behave to achieve success. The need for actual project leadership, not just project management aptitude, is vital when project planning, development, and execution are complex. Complexity is not just defined by size, instead complexity occurs in three dimensions. One dimension is scope complexity—often when scope is complex, it entails three or more distinct sub-projects. The second dimension is organizational complexity—for example, when a project requires a central support hub, but manages work indirectly. The third complexity dimension is shaping—when projects have four or more stakeholders, either internal or external, this leads to shaping complexity. A project leader possesses the skills to understand and respond to all three complexity dimensions. Leaders are adept at articulating a clear vision for a project; getting all stakeholders to agree and cooperate in meeting objectives; and generating strong followership from teams, including other leaders. So, if the leader is so important, how do you identify who should lead your most difficult and complex projects? Most companies have answered that question by appointing those who have done well or at least reasonably well on middle-sized and less complex projects. In a detailed study of over 100 directors of complex projects, Ed Merrow, Founder and CEO of Independent Project Analysis (IPA), Inc., and Neeraj Nandurdikar, IPA Oil and Gas Practice Director, have found that many have been doing this all wrong. Success on simpler projects is not a particularly good predictor of success on highly complex projects because the personalities, habits, behaviors, and preferred tasks of the most successful complex project leaders do not look much like traditional project management. Complex projects require leadership, not just management. Successful complex project leaders have many of the same characteristics as leaders in other walks of life, but in a project context. 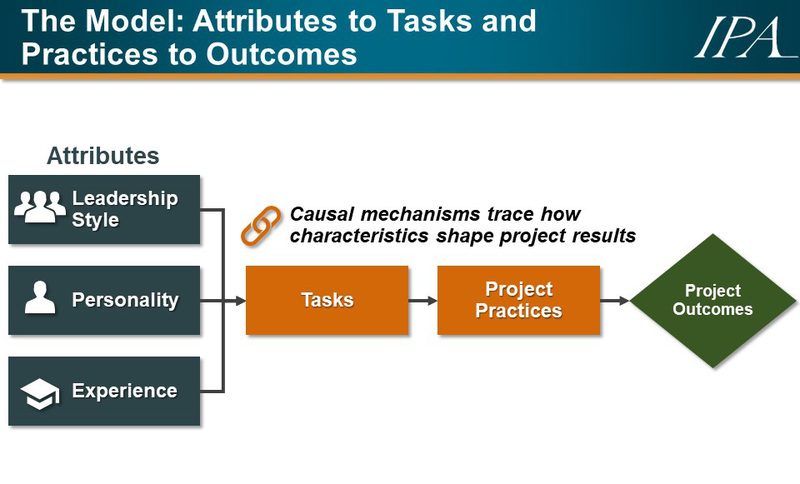 Using the model shown above, Merrow and Nandurdikar have quantitatively linked individual characteristics to project outcomes. More specifically, they have demonstrated links between a more generalist orientation; certain personality traits, especially openness; high emotional intelligence; and certain types of experience and more successful project results. In addition, they have investigated the causal mechanisms that get us from personal traits to project results by understanding the actual tasks that project leaders think are important and how their decisions to focus on some tasks lead to degraded practices that, in turn, directly shape project results. This work has allowed us to develop detailed profiles that indicate the attributes of a person that are most likely to support them in successfully leading complex projects. By comparing individuals to this profile, companies can make smarter decisions around the hiring and assigning of individuals to lead their complex projects—and, consequently, improve their likelihood to successfully deliver these important projects. Further, the profiles can also be used to more strategically develop the most promising candidates in your organizations to be highly successful future leaders. The results of this work form the basis of IPA’s Functional Competence Assessments and have also been published in the book Leading Complex Projects, the third book in a series written by IPA’s industry-recognized experts in the capital projects industry. Merrow is the author of the first book in the series, Industrial Megaprojects: Concepts, Strategies, and Practices for Success (John Wiley & Sons, 2011). IPA Capital Solutions Director Paul Barshop wrote the second, Capital Projects: What Every Executive Needs to Know to Avoid Costly Mistakes and Make Major Investments Pay Off (Wiley, 2016). For more information, visit IPA’s Organizations & Teams page.